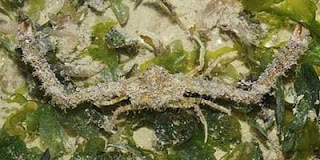 An elbow crab amongst seaweed, showing both its long reach and well-developed camouflage. Photo from Wild Shores of Singapore. Lift up one arm, and bend your elbow. Reach with your fingers to a point on your back, between your shoulder-blades. Scratch. Not only will that work wonders for any annoying tingle that you might have been feeling, but you have just demonstrated your superior flexibility to an elbow crab. Crabs of the family Parthenopidae are found in tropical and subtropical coral reefs and shelly sea bottoms. 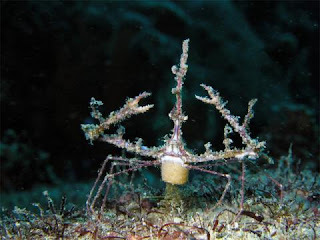 Most species have bodies that are roughly triangular in shape, and often highly ornamented with lumps, bumps and spines (this ornamentation makes them very difficult to see among coral and rocks; it also encourages the growth of algae and other camouflaging organisms on the crab). They also usually have very large and long chelipeds (pincers), which make it easy to see how they got the name of 'elbow crabs'. The merus (the 'upper arm' part of the cheliped) is proportionally much longer than in many other crab families, giving parthenopids a real gorilla-ish look (I found one website that labelled a parthenopid of the genus Daldorfia as the "King Kong crab"). Despite their extraordinary size and length, however, the range of mobility of an elbow crab's chelipeds is limited, hence the point about back-scratching above. An elbow crab cannot reach the middle part of the top of its carapace. 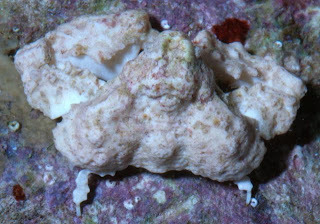 Furtipodia petrosa, a rather adorable-looking parthenopid from Guam that resembles a sponge-covered rock. Furtipodia is also one of a number of parthenopids in which the walking legs are hidden by the carapace, improving the disguise. Photo from here. This lack of cheliped mobility is one of the features distinguishing members of the Parthenopidae from the spider crabs of the Majidae, which have a broadly similar superficial appearance (Ng & McLay, 2003). Other distinct features of the family include the fusion of the third to fifth segments of the male abdomen* (Tan & Ng, 2007); also, while female majids have a high-domed abdomen that forms an entirely enclosed brood chamber for her eggs, the parthenopid female's abdomen does not entirely seal the eggs away from the outside world. The similar adult appearance of Parthenopidae and Majidae, with their triangular bodies and pointed snouts, lead most early authors to regard them as closely related, but the similarities are now thought to be convergent. 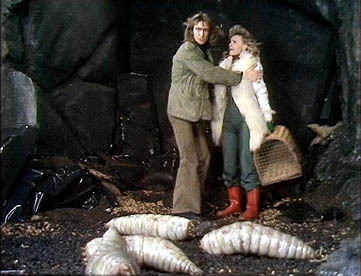 The larvae of parthenopids are more similar to those of other families than majids (Yang, 1971), while phylogenetic studies do not support their association (Brösing, 2008). Normal parthenopids are remarkable enough, but Lambrachaeus ramifer looks like something out of a Japanese video game (making it appropriate that I found this photo on a Japanese website). This individual is a female carrying eggs - they're the orange mass on her underside. The subfamilial classification of Parthenopidae was reviewed by Tan & Ng (2007) who recognised only two subfamilies of elbow crabs, the Parthenopinae and Daldorfiinae (earlier authors recognised more - some have been moved to other families, others have been synonymised). The two subfamilies are distinguished by only a single character, the relative length of the antennal segments, and a more formal analysis is still required to test their distinction. A separate subfamily had previously been recognised for the very distinctive Indo-Pacific species Lambrachaeus ramifer which has the front of the carapace extended forward into a long neck (Ng & McLay, 2003), but Tan & Ng (2007) placed this species in Parthenopinae, noting that it had been separated on the basis of its own peculiar autapomorphies rather than by lack of the features of other subfamilies. *If you don't know where to find the abdomen of a crab, then look at the underside of one the next time you're able to. The much reduced abdomen is turned forwards and held on the underside of the cephalothorax. In males, it is a small, narrow segmented strip. In females, it is much larger and broader, and is used to hold her eggs. 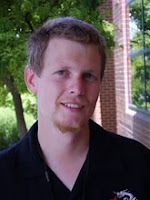 Brösing, A. 2008. A reconstruction of an evolutionary scenario for the Brachyura (Crustacea) in the context of the Cretaceous-Tertiary boundary. Crustaceana 81 (3): 271-287. Ng, P. K. L., & C. L. McLay. 2003. On the systematic position of Lambrachaeus Alcock, 1895 (Brachyura, Parthenopidae). Crustaceana 76 (8): 897-915. Tan, S. H., & P. K. L. Ng. 2007. Descriptions of new genera from the subfamily Parthenopinae (Crustacea: Decapoda: Brachyura: Parthenopidae). Raffles Bulletin of Zoology Supplement 16: 95-119. Yang, W. T. 1971. The larval and postlarval development of Parthenope serrata reared in the laboratory and the systematic position of the Parthenopinae (Crustacea, Brachyura). Biological Bulletin 140: 166-189. I'm demonstrably able to reach every spot on my backs with my fingertips, either from above or from the side/below, but whenever I actually try to scratch an itch, it seems forever just out of reach. I'm forced to conclude itches have wills of their own and purposely move out of reach whichever way I'm trying to reach them. A problem easily solved. Simply print numbered grids on the back of all your shirts, and you will be able to guide anyone to the itchy spot with mathematical precision. GIANT ENEMY CRABS! SHOOT THE WEAK POINT FOR MASSIVE DAMAGE! !